In Microsoft outlook, files are saved with the extension name (.ost) hence, .ost files can be called offline file folders for Microsoft outlook files. These ost files make work easier. The ability to work without an internet connection or at your pace is incredibly important. The ost files allow you to synchronize your work when you come online with the exchange server so any changes made are noted. Ost can also be called an offline storage table. It can be used to store a copy of your mailbox, even though the size of your ost file and mailbox won't correspond as it is not a representative of the latter. What is stored in your ost file also depends on your usage of an exchange/IMAP account? 1. Why You Should Delete an Outlook OST File? 2. How to Delete an OST File? 3. How to Create a New Outlook OST File? 4. How to Recover an OST File if You Deleted it Accidentally? Outlook files are stored in both .ost and .pst modes. An ost file can be damaged in a number of ways and this, in turn, will lead to your outlook performing abnormally. In some other cases, the ost file becomes inaccessible and unreadable which is a problem for the user. Abnormal behavior of an ost file can also be caused by a virus intrusion into the system or a failed synchronization. To repair these problems, you can either resynchronize the exchange server with outlook and see if the issue is fixed or use a recovery software such as AnyRecover to get back your lost data. Before you consider deleting an ost file, remember to synchronize it with the exchange server. Deleting an ost file will erase all the offline storage of the said file. There still exists the possibility of data loss when deleting an ost file. Deleting an ost file is pretty straight forward if you know where to search. The locations of various ost files differ in different versions of Outlook. Here are a few steps to follow if you’re considering deleting an ost file. Close the Outlook window if it is currently running. Use the run window by pressing windows key and r.
Type in “%LOCALAPPDATA%\Microsoft\Outlook\” and click enter. Select the ost file you wish to delete. To allow Outlook function properly, an ost file is needed. Each Outlook version has different methods leading to the creation of an ost file. so here are steps to help guide you through it. In Outlook 2007 open the tools menu, while in 2016/2013/2010 click on file then from the drop-down click info. Go to account settings then click on Microsoft exchange. Click the more settings button from the window that pops up. Hit the advanced button, then click on the offline folder file. Create a path to save the ost file. The default name is outlook.ost. Go to the tools tab and hit e-mail account. Find the outlook process email for the account in your order box. Click on Microsoft exchange server then hit change. Click the more setting option. Click advance from the menu tab and hit offline folder file settings. Open a new path to save the new .ost file. Click next and hit the finish. Recovering a deleted file is hard but not necessarily impossible. There are a number of methods to help you get back your files. The first step is checking the recycle bin for the deleted file. If it is there all you need to do is hit the restore button in the recycle bin and your previously deleted ost file will be restored. Otherwise, you can go into account settings, proceed to change the cached exchange mode off then restart your Outlook. This will reconnect you to the exchange server and restore what was deleted. Turn cached exchange back on. If this still doesn't work you will need recovery software to perform this task. 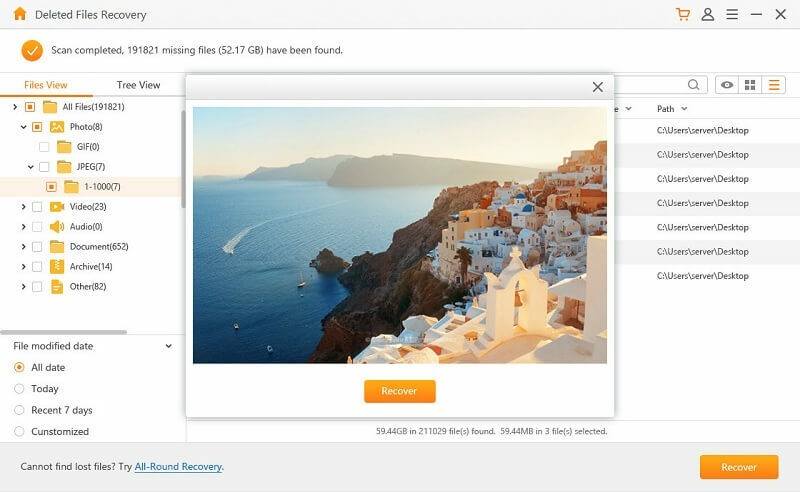 AnyRecover is great recovery software that will help you get back your deleted files and it is incredibly easy to use. 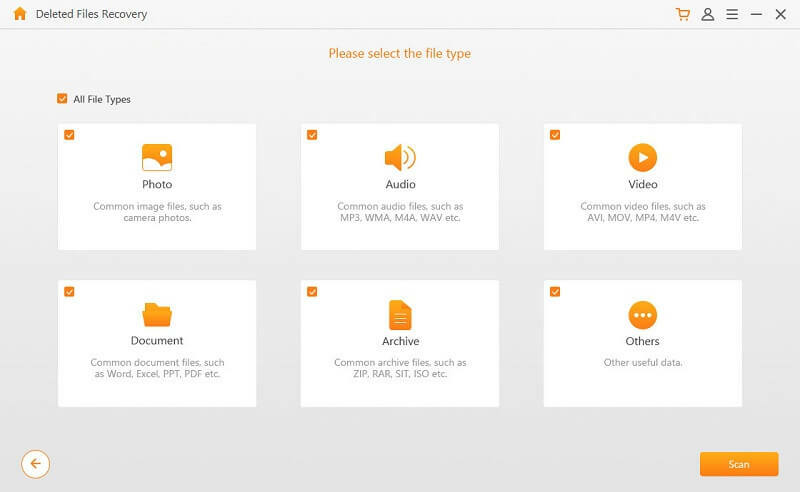 It recovers more than 1000 types of lost files including images, videos, audios, documents, etc. It supports all kinds of storage devices such as memory cards, hard drives, flash drives, digital cameras and more. 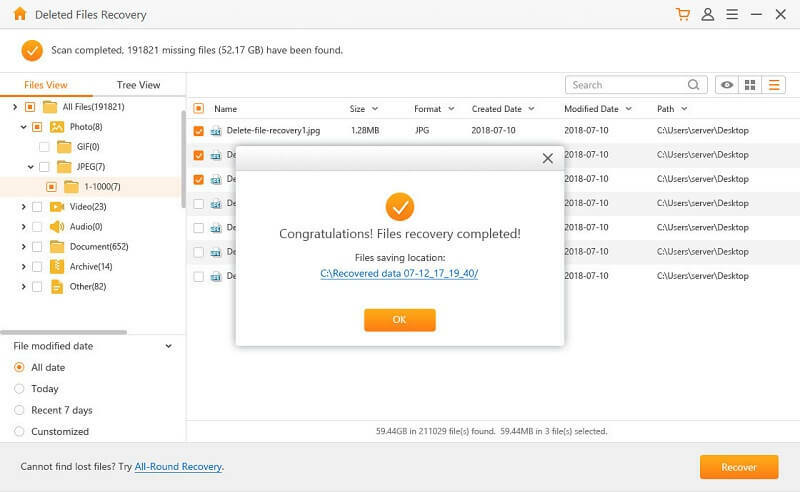 Restores files in various scenarios via accidental deletion, formatting, lost partition, OS crash, damaged hard drive, and virus/malware attack. 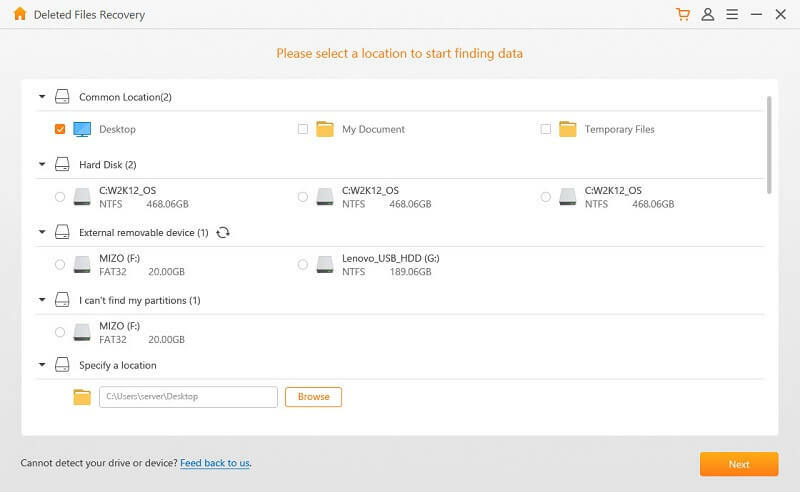 Provides a trial version and lets you recover first 3 files for free. Step 1: 	Start the AnyRecover program and choose the mode of operation which best suits your needs at the time from the options provided. Step 3: Choose file types and click “scan” for the program to begin working on the recovery of the documents lost. 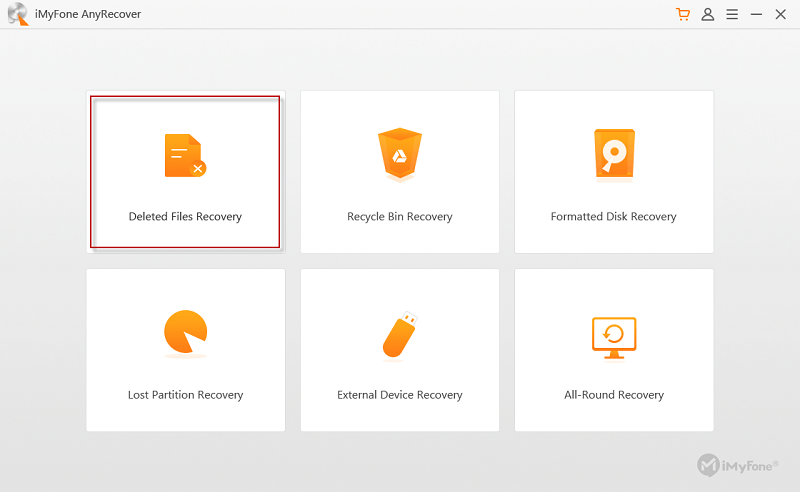 Step 4: When the files are shown, preview and choose which files you want to extract then click “Recover”.